The early 20th century in the United States was known as the Industrial Revolution. Electricity brought life to the American skyline. 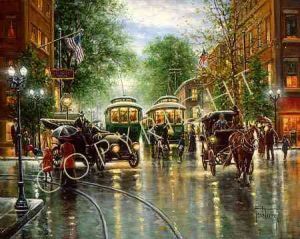 Cable cars introduced mass transit to the cities and the automobile soon replaced the horse and buggy. It was a time when America rightly matured into the greatest nation on earth. Families walked the streets with pride and young boys peddled newspapers on street corners. America was truly on the move as the rest of the world looked on with amazement. This painting portrays early evening in a typical American city in these "Busy Times."